People buying fruit and vegetables for Eid. 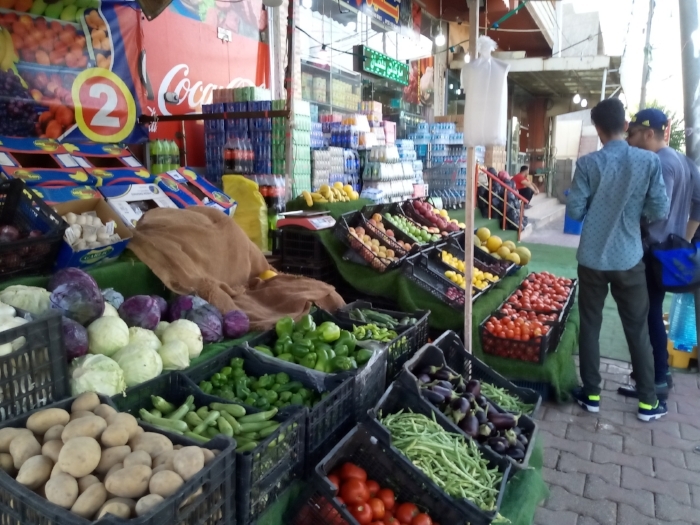 On Monday, the day before Eid, shops in Suleimani, in Iraqi Kurdistan, were crowded with people buying last minute fruits and vegetables, sweets and other special foods. The next morning, streets were mostly empty as families gathered together for their Eid breakfast. Muslims around the world celebrate the Eid al-Adha starting on the 10th day of the Hajj in Mecca, commemorating God’s intervening to stop Abraham from sacrificing his son. Also called, “the feast of sacrifice,” it’s a time when families sacrifice animals and share the meat with their neighbors and relatives, as well as the poor in their community. Throughout the four-day holiday, family and neighbors called on each other for visits. As we shared in the celebration, I couldn’t help but think of those who have been protesting in central and southern Iraq, insisting that the government provide basic services, such as clean drinking water, electricity, and jobs for the unemployed. They are calling for the corrupt government systems to be overhauled. I heard that the drinking water for the four million people in the southern Iraqi city of Basra has reached dangerous levels of chemical and bacterial contamination, resulting in 4,000 reported cases of severe diarrhea and vomiting in a week. * Protesters say the government has done nothing to deal with the problems and have responded to them with brutal suppression. In the Kurdish region, teachers and other government employees had been protesting for three years because of lack of pay. In December 2017, demonstrations increased and repressions by the government became more intense, with random arrests and one teacher killed in the city of Koya. Then there was a small breakthrough and the government agreed to give them 75% of their salaries. Change in the many countries around the world, where corruption and injustice persist, usually doesn’t come quickly. Often small gains are sandwiched between times when nothing seems to happen or the movements seem to lose ground. Those working and sacrificing for justice get discouraged, though their longing and determination don’t die. It may be years until new circumstances and openness allow it to break through. In many cases, however, such as in Basra, the stakes are high—a matter of life and death and the possible collapse of a city and region. Eid celebrations don’t resolve or erase the national strife, the government corruption, the beleaguered economy, the water crises, and the personal struggles of the poor. But it’s a time when people seek strength and meaning through one’s faith, and to be generous and enjoy the love of family and friends. Such celebrations outwardly express and make visible the loving and generous hearts of the people in this region and are evidence of their deeper strength—such strength that is needed for the hard work ahead.